This is a GPRS based Biometric System with provision of Finger/Thumb as well as RFID card identification. The Parent / Warden / Chief-Warden get an instant SMS / Email Notification through Automatic SMS / Email on their mobile phones / mail box as soon as students check-in / check-out the hostel. The Hostel Authority has to decide the timing for Check-In / Check-Out the Hostel and which mode they prefer for Student Attendance Marking either Finger/Thumb or RFID Card. Accordingly students will be given instruction to mark their presence in front of Biometric Machine. 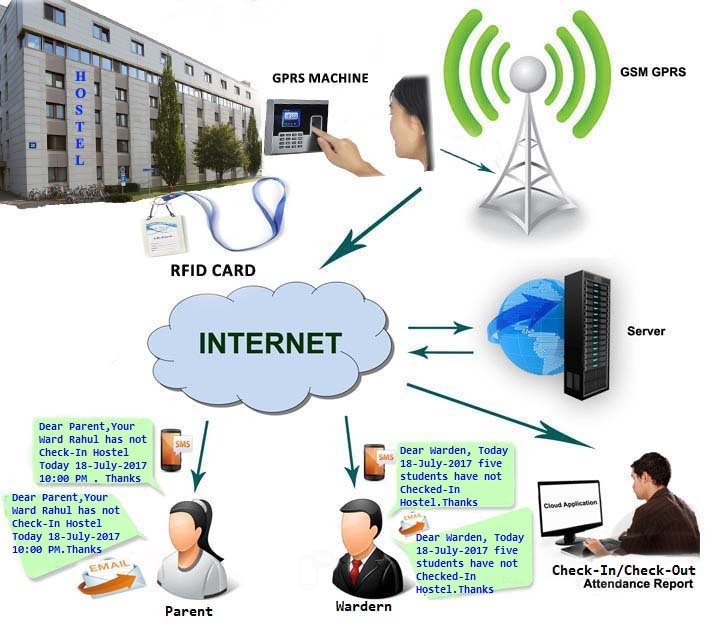 The RFID cards can be used as Student ID-Card. As student shows their Finger/Thumb or RFID Card on Biometric Machine during Check-In / Check-Out timing of the hostel, their parents, whether they are at home or at office, they come to know that their child has Checked-Out or Checked-In the hostel through an instant Real-Time Automatic SMS or Email “Dear Parent, Your Ward Rahul has Checked-In the Hostel today 18-July-2017 10:05 PM. Thanks” and Automatic hostel Attendance is done. If any student does not Check-In / Check-Out the hostel in predefined time period then automatic Absent SMS / Email notification goes to Parent’s / Warden’s Mobile / Mail Inbox instantly “Dear Parent, Your Ward Rahul has not Checked-In the Hostel today 18-July-2017 10:30 PM. Thanks” . Absentee Student Report Daily Basis. Hostel Student’s Daily Check-Out / Check-In Attendance Report. Hostel Student’s Weekly Consolidated Check-Out / Check-In Attendance Report. Hostel Student’s Fortnightly Consolidated Check-Out / Check-In Attendance Report. Hostel Student’s Monthly Consolidated Check-Out / Check-In Attendance Report. Daily Check-Out / Check-In of their ward. Weekly Consolidated Check-Out / Check-In Attendance of their ward. Fortnightly Consolidated Check-Out / Check-In Attendance of their ward. Monthly Consolidated Check-Out / Check-In Attendance of their ward. Wireless Plug and play system [Just need to put power]. No Wiring Required. Very easy operations, no need of skilled or professionals. Web based interface, REPORT can be monitored from anywhere across the world. MIS Reports - Absentee report / Daily / Weekly / Monthly attendances register. Less administration work / Improve student’s attendance ratio and monitoring & controlling on student activities.